A Powerful integrated Retail Business Tool bringing superior service to the retail & hospitality industry, including Restaurant Menu’s, cafeterias, catering, golf clubs, and hotels. So sit back, relax & start accepting reservations and payments directly from your website and or the Mobile app using the integrated booking button. A point-of-sale system is a great tool to manage all these moving parts while helping to ensure customer satisfaction, but finding the right POS for small business is no easy feat. Retail store owners operate on tight margins, and have many constantly moving parts. This becomes especially difficult to manage efficiently when using manual methods. You’re not alone in feeling this way: of the thousands of small merchants we talk to each year, 65% of single-store retailers still don’t have a POS system in place. Also Installing a new POS system usually means a difficult learning process, installation costs and hours on the phone with customer support. That is no longer the case! Our POS is a hosted software. This means that all of the software is supported and maintained by our certified engineers. There is virtually no set-up on your end and we provide full training for you and your staff! “POS can help businesses in a variety of ways, including customer retention, providing customer management data, identifying opportunities and weaknesses in the store and much, much more." Allows you to capture and analyze your store’s sales data on daily, weekly & customized range basis. Creates intelligence around buyer behavior to get more control around customer data. Allows you to easily store and manage customer purchase histories, contact information and even loyalty points. Our POS allows you to monitor who’s working, how long they’re working in the current pay period. This last aspect allows you to monitor for (and reduce) overtime. 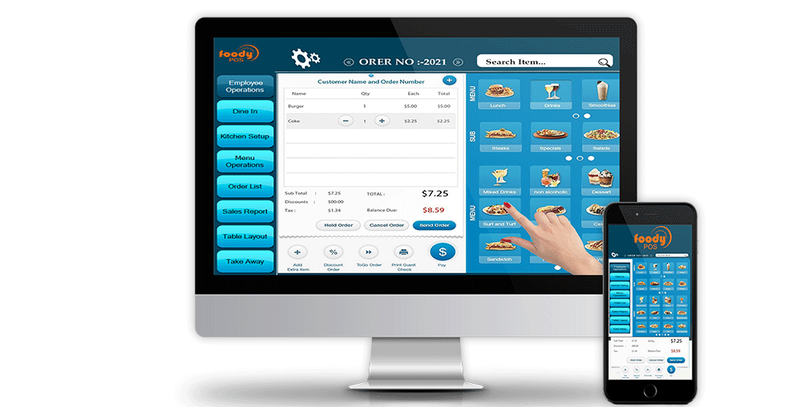 Reduces transactions completion time by automating all aspects of customer order & conclusion. The tool simplifies your transaction process using the intelligent in build software algorithms.